The district Mestre of Venice on the mainland: sights, eating, hotel tips and much more information. Venice was once a city consisting only of islands. In 1926, areas on the mainland were incorporated for the first time, including the region of Mestre. Today, the district of Venice Mestre has almost 200,000 inhabitants, much more than all the islands of Venice put together (about 100,000 inhabitants). While the population on the actual islands of Venice continues to decline (currently in 2019), Mestre has grown strongly in recent decades. Mestre and the main island of Venice, the historical centre, are connected by a 3-km-long car and railway bridge. It is the only bridge to the island of Venice. Not only many locals have moved from the main island of Venice to Mestre mainly because of the high rents. Also the hotels on the island are very expensive. Thus, the majority of holidaymakers also choose one of the many hotels in Mestre or around. There is hardly a street in the centre of Mestre without hotels or pensions. The tourists go every morning by train, tram or bus to Venice and back again in the evening. By train it takes only a few minutes. Reserve a parking space: Parking spaces are rare in Venice, multi-storey car parks are often full. It is therefore advisable to reserve your parking space. On this website you can book parking spaces in Venice (including the big car parks in the Old Town of Venice, in Meste and at the airport). Mestre consists mainly of relatively new houses. There are not many sights in Mestre. However, the city has a beautiful city centre about one kilometre north of the railway station. 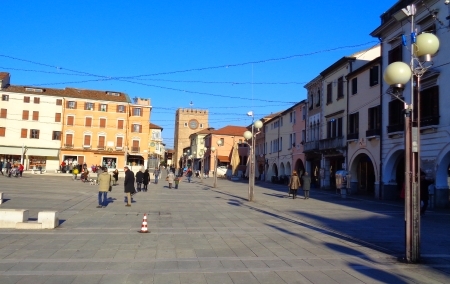 The central square is the "Piazza Erminio Ferretto" in the middle of the pedestrian zone in the city centre. Here there are some smaller department stores, many shops and street cafés (see picture above). 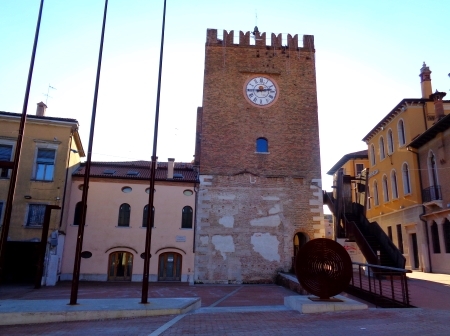 The most famous old building in Mestre is the "Torre dell'Orologio". The tower has existed since the 13th century, when Mestre was a small village. The Torre dell'Orologio should not be confused with a tower of the same name in the centre of Venice. Our top favourite tip among the pensions in Mestre is the Chiara Lodge. Great rooms with international TV, fast WIFI Internet. In January 2018 I paid only 30 Euro for a single room including a high quality Italian breakfast. In the summer the small pension with 10 rooms is much more expensive. To the station Mestre (train to Venice) it is only 5 minutes by foot, bus line 2 to Venice only two minutes by foot. The two employees I got to know are very nice. You can quickly get in touch with them (in English). The two young employees at the reception were a good source of information for me on all questions about Venice. Current prices and booking possibilities of Chiara Lodge Mestre on this link. Our second tip for staying overnight in Mestre is the small 5-room guesthouse with the name L'Affittacamere Di Venezia a few hundred metres further towards the centre of Mestre. A very good overview of many hotels, apartments and guesthouses in Mestre can be found on the website www.Booking.com (over 250 accommodations). The extended central area of Mestre is the region between the railway station and the city centre described above (distance approximately more than 1 km). In this area are the majority of the many hotels for tourists. There are many kebab shops and other fast food restaurants such as Pizza and Asia Food. The prices are clearly lower than in Venice. A kebab almost everywhere costs 3,50 Euro, a big piece of pizza about 2,50 Euro. In Mestre there are some very big supermarkets, also many inhabitants of the island Venice come to the shopping in the big suburb. The huge Interspar in the street Corso del Popolo, approximately 500 metres away from the railway station Mestre, is probably the biggest supermarket in Mestre and all Venice. There is also a McDonald's in the building. According to our impression, I should be particularly careful with near Mestre station, especially at night. Here we saw several times some drug addicts, some of them quite aggressive. The public bus is the only really cheap way in Venice to get from the two airports to the centre of Venice and to Mestre. The modern buses often run in both directions. For airport buses, we recommend the uncomplicated purchase of tickets in advance on the Internet. This avoids long searches for the right ticket counter, queues and language problems. On the 3 links below you will find both simple tickets and cheaper return tickets.